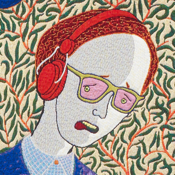 Award-winning, British artist, Grayson Perry presents his six tapestries 'The Vanity of Small Differences' up-close. The app features commentary from the artist, art historical references and a guide to the 'making of' the works. Through the six tapestries, Grayson Perry explores his fascination with taste and the visual story it tells of our interior lives. The artist goes on a safari amongst the taste tribes of Britain, to gather inspiration for his artworks, literally weaving the characters he meets into a narrative partly inspired by William Hogarth's 'A Rake's Progress'. - Grayson Perry commentry for each of the tapestries. - Art historical references and illustrations. - A chance to see the tapestries up close. - An essay on the making of the works.